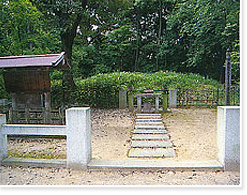 The foundations for Chikurinji Temple were put in place by High Priest Gyoki (668-749) during the Nara period. Gyoki passed away at Sugaharadera Temple in Nara City at the age fo 82. He was cremated on Mt. Ikoma and laid to rest in Chikurinji Temple. On the right hand side, towards the main hall, lies the tomb of Gyoki and to the left stands the five-ringed tower of the tomb of Ninsho. Ninsho greatly respected Manjusri (one of bodhisattvas associated with transcendent wisdom) and Gyoki and tried to continue his charitable work. In accordance with his last will, his remains were divided into three portions and they were entombed at Chikurinji Temple, Gokurakuji Temple in Kamakura City and Kakuanji Temple in Yamatokoriyama City.